A recent tweet from Firestone Walker Brewing Company and TheBestCraftBeer.com gave me a chuckle and amazed me at people's creativity. Meet the Shakoozie. This magical device allows its user to enjoy a beer while in the shower. Just pause and think about that. Showers bring hot relaxation and beer brings cold relaxation. Combine the two opposites together and there must be magic, much like sweet and sour sauce. 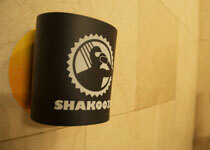 The Shakoozie allows beer to be placed away from annoying things like warm water spray and soap suds. It also insulates the beer glass (please do not drink your beer directly from the bottle) from the heat of the shower and keeps it cool. Wow! To be honest, the idea of showering with a beer never occurred to me. I am trying to imagine the set of circumstances that led the inventor of the Shakoozie down that road. Perhaps the inventor was trying to recover from a hangover using two different methods, or perhaps the inventor loves to multi-task and just could not put that beer down. Who can say what the impetus for the invention was, but I can say that reading about the Shakoozie gave me a good laugh during a busy week, which is very appreciated. Who knows, maybe I will have to try it out some day.